You have to admire Mario’s dedication. After all, how much of a relationship must he have with Princess Peach, when she’s constantly being abducted by Bowser? There must have been a time when Luigi sat him down and asked if she was worth all the hassle. Well, you would, wouldn’t you? But although it’s unclear as to what type of relationship the pair have (we suspect that she placed him in the friends zone some time ago, but Mario just can’t accept it), Mario is always there for the princess, when she inevitably gets nabbed. Here is a re-visit of a previous adventure, AKA as a port, of the Wii U original, first released in 2012. And Mario said nothing would come of my topiary class! Once again, before Mario can enquire if PP (his nickname for her highness) would like to hang out and Netflix and chill, Bowser throws his considerable weight around, grabs her, and swans off into the distance. Mario can either go it alone, or include up to three other chums to join him on his adventure, as he traverses tricky 2D terrain in the name of love. 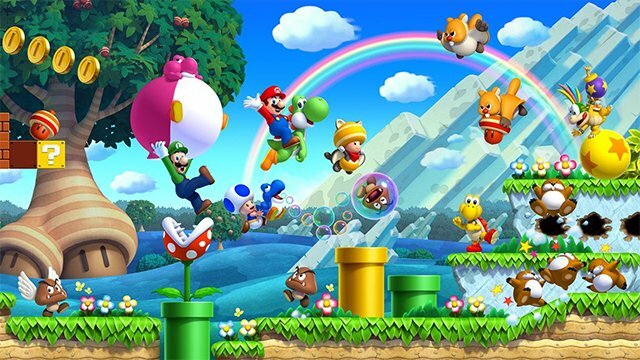 Despite its cutesy characters, colourful worlds and cheery retro soundtrack, Mario’s adventures in the second dimension are notoriously difficult. It’s a simple premise: make your way to the end of the right hand of the screen without dying. Within a limited time. With one or two obstacles in your way. Oh and with all the free time you have, why not look out for secret areas why you’re at it. After only a brief period of playing, a passer-by could easily mistake whoever is playing to be suffering from Tourettes, with the air turned a very dark hue of blue. This version does include a near invincible character though – Nabbit – to help ‘youngsters’ Nintendo say – yeah right. But quite frankly, if you’re not pulling your hair out on a level by level basis, you’re not playing the game. Ahhh, another quiet day at the office! 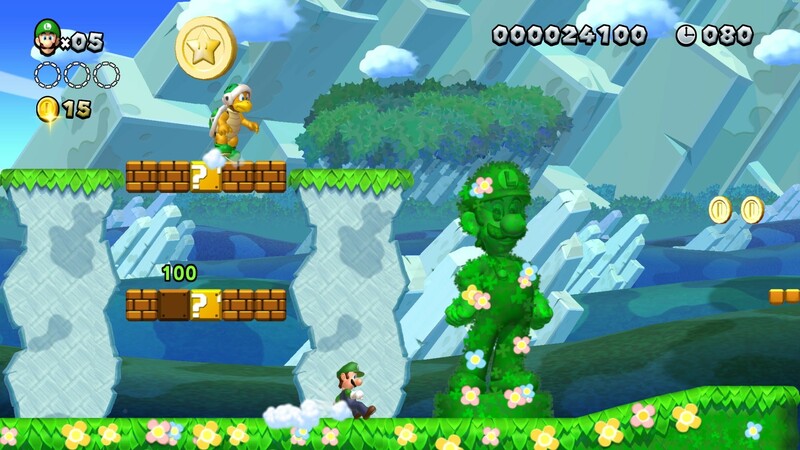 However, this version also includes the more demanding New Super Luigi, where Mario’s bros manages to have an even trickier time of it all, as hard as that is to believe. And apparently, when you add up all the levels available, there are a thumb-numbing 164 in total to get through. Though to be fair, you would have to be some type of sadist to do that to yourself. Yes, you will die a lot, but the HD brightness of it all means that you will no doubt be in a semi state of awe and wonder as you do so, which is some consolation. And if you don’t find the game demanding enough, there are plenty of unique bonus challenges available that could easily have that Joy-Con flying out of your hand, if it wasn’t for the fact you were physically attached to it, thanks to the supplied wrist band – phew! A minor quibble throughout would be the controls; for some actions, like throwing an enemy trapped in ice for example, the button combos are just a bit too fiddly – certainly with the Pro controller at any rate – and it would have been far preferable if one of the controller’s many buttons had dedicated actions, without having to wrestle it at tense moments throughout the game. The only real negative that can be levelled at the game is the fact that it is a port of a six year old game. A great six year old game, but still part of a past gen console’s collection. If you own it on the Wii U, it’s really not worth owning this one, unless playing it on the go is important to you. For everyone else, platformers don’t come more classic than this. Not for the faint-hearted, but if you love the notion of loved-up plumbers going up against all odds, this is for you.